Sandeman’s black-cloaked ‘Don’ has become one of the most recognisable motifs of the wine industry. Dressed like the Spanish caballeros de Jerez in his cape and wide-brimmed hat, the Don was designed in 1928 by Scottish poster Artist George Massiot Brown. But by that time the Sandeman wine company had already been trading for almost 150 years, started by George Sandeman, another young Scotsman from Perth, in 1790 to trade in Port and Sherry. By 1795 Sandeman had established an agency in Cadiz, Spain, and by 1811 he had purchased an Port cellar in Villa Nova de Gaia in Oporto. 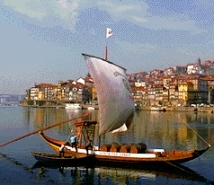 In the modern era, Sandeman has become a Portuguese-owned company. After a brief ownership by the Canadian Seagram company, Portugal’s Sogrape Group bought Sandeman in 2002 to join their other wine brands, including Ferreira Port, Mateus, Finca Flichman in Argentina and Framingham in New Zealand. I recently paid a brief visit to Sandeman’s impressive new visitor facility and winery in the Douro Valley, at the Quinta do Seixo (view from the terrace, left). Guides show visitors around the cellars and the production processes, including the robotic lagars (inset) that closely replicate the traditional method of treading Port grapes by foot. 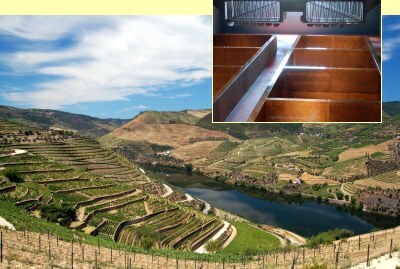 The centre is a wonderful addition to a tourism scene in the once sleepy Douro, that is developing fast. Quite closed, though a refined black fruit quality with more of a blue/black concentration. There’s a schisty sense of minerality in a complex, layered profile. On the palate a lovely lightness and racy quality, with refined fruit layered with black plum, spices and a bittersweet coffee richness becoming smooth and chocolaty in the finish. Very good indeed. Around £40 – £50. Wines destined for the 30-year-old are selected early: must be dark, structured, intense wines. Lovely burnished tawny colour with a hint of ruby at the core. Beautifully nutty and spicy, with layered biscuit and toffee notes, a suggestion of dried figs and orange. The palate has lovely sweetness. The alcohol is rich and mouthfilling, but the sweetness comes through, and the toffee and honey, glycerine richness fills the mouth. Spices and sultana cake character into a long, layered, balanced finish. £55 – £60.